Thirst is a great motivator. Inherently, we know that to go without water will lead to death. Indeed, without water life cannot be sustained. There is no life where there is no water. The Israelites were in a thirsty predicament in the wilderness. There was no earthly way to find any water, and grumbling and complaining soon set it. These people were ready to kill if that is what it took to get a drink of life giving water. The events are documented for us in Exodus 17. Things are not looking good for Moses. In fact, without divine intervention, he was in for a painful death. But God intervenes on behalf of Moses and the people. He makes a promise that those who are seeking divine nourishment will one day have their hunger and thirst quenched. Jesus alludes to this again in John 4 when speaking about water to the Samaritan woman at the well. So where is this water going to come from that Jesus is promising to not only provide, but to fill us up with? Paul talks about the Exodus account we read earlier and ties it together for us. Jesus himself was the Rock from which would flow waters that would give eternal life to all who drank of it. When He was on the cross of Calvary, Jesus our Rock was struck by a Roman spear, and out flowed blood and water. As He was pierced for our transgressions (Isaiah 53) eternal life was made available to all. The veil in the temple was torn from top to bottom and eternal life became available to all who would receive it. Jesus also foretold at the great feast that the river of water would not stop there. It would be an unending stream that would flow out as the Spirit to fill and satiate those who come unto Christ. 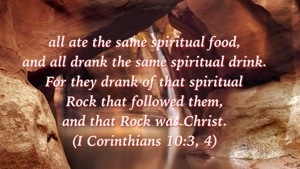 So if you are spiritually hungry or thirsty, come unto the Rock who was stricken for you and receive this living water!